To determine the origin of the feast of the Conception of Saint Anna, which is celebrated by the Church on December 9th, we must take into account the genuine documents we possess, the oldest of which is the Canon of the feast, composed by Saint Andrew of Crete, who wrote his liturgical hymns in the second half of the seventh century, when a monk at the Monastery of Saint Savvas near Jerusalem (he died as Archbishop of Crete at about 720). But the celebration cannot then have been generally accepted throughout the Church, for John, first monk and later bishop on the island of Evia (Euboea), at about 750 in a sermon, speaking in favor of the propagation of this feast, says that it was not yet known to all the faithful (ei kai me para tois pasi gnorizetai; P.G., 96, 1499). But a century later George of Nicomedia, made Metropolitan by Patriarch Photios in 860, could say that the celebration was not of recent origin (P.G., 100, 1335). It is therefore safe to affirm that the feast of the Conception of Saint Anna appeared in the East not earlier than the end of the seventh or the beginning of the eighth century. As in other cases of the same kind the feast originated in the monastic communities. The monks, who arranged the psalmody and composed the various poetical pieces for the office, also selected the date, December 9, which was always retained in the Eastern calendars. Gradually the celebration emerged from the cloister, entered into the cathedrals, was glorified by preachers and poets, and eventually became a fixed feast of the calendar, approved by Church and State. According to Procopius, during the reign of Emperor Justinian (527-565), a church was built to honor Saint Anna in Constantinople. Emperor Justinian II (685-695; 705-711) restored her church, since Saint Anna had appeared to his pregnant wife. It was at this time that her body and maphorion (veil) were transferred to Constantinople. The relics of Saint Anna were brought from the Holy Land to Constantinople in 710 and were still kept there in the Church of Hagia Sophia in 1333. 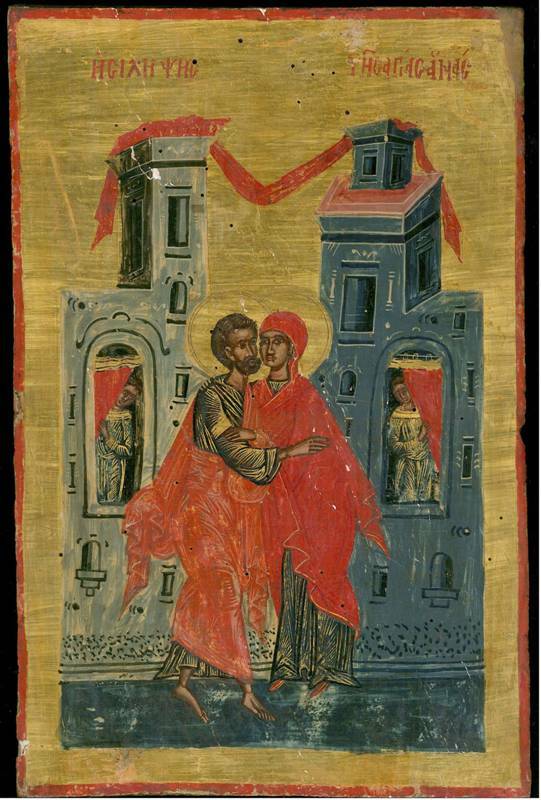 These events surely helped spread the veneration of Saint Anna to Constantinople from the Holy Land in a special way, together with the establishment of the feasts at around this time period dedicated to the Mother of God. 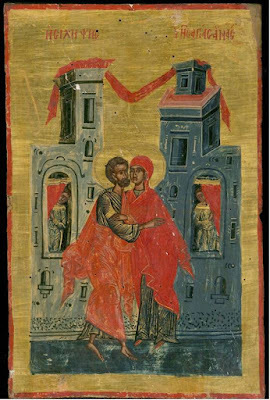 The feast of the Conception of Saint Anna is registered in the Menologion of Basil II (976-1025) and by the Constitution of Emperor Manuel I Komnenos in 1166 as being among the days of the year which are half or entire holidays, that is, it is numbered among the seventy-three days which have a full sabbath rest for the entire Roman Empire. Up to the time of Basil II, Lower Italy, Sicily, and Sardinia still belonged to the Roman Empire centered in Constantinople; the city of Naples was not lost to Byzantium until 1127, when Roger II conquered the city. The influence of Constantinople was consequently strong in the Neapolitan Church, and, as early as the ninth century, the feast of the Conception of Saint Anna was doubtlessly kept there, as elsewhere in Lower Italy on 9 December, as indeed appears from the marble calendar found in 1742 in the Church of Saint Giorgio Maggiore at Naples. It should be noted that in the West the feast of the Conception of Saint Anna turned into the feast of the Immaculate Conception after the schism, and was transferred to December 8th, in order to perfect the nine month period of pregnancy of Saint Anna concluding with the feast of the Nativity of the Mother of God on September 8th. In the East, a perfect nine month pregnancy period is only reserved for Christ, Who was conceived on March 25 and born on December 25. The other two conceptions celebrated in the calendar of the East, that of the Virgin Mary and John the Baptist, are purposefully off by one day to distinguish their birth from that of the God-man Christ. But why is the feast celebrated on December 9th? It appears that the feast of the Nativity of the Virgin Mary on September 8th preceded the feast of the Conception of Saint Anna, therefore by the mere calculation of nine months prior to September 8th, we come to December 8th, with one day added to not identify her or equalize her with Christ, Who alone was born sinless and perfect.